gretchengehrke was awarded the Basic Barnstar by warren for their work in this research note. This is Part 1 of an ongoing series of case studies by Gretchen Gerhrke, Public Lab's Data Advocate, highlighting different stories of environmental data's use in the Public Lab community. You can find the entire series here. 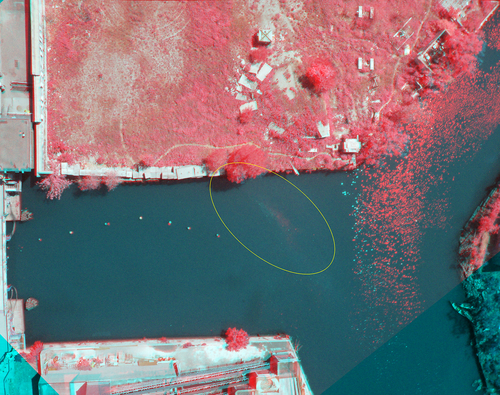 Above, a false-color composite image incorporating near-infrared and visible-light photographs of a section of the Gowanus Canal, by the Gowanus Low-Altitude Mapping group. The Public Lab infrared images you refer to here are not thermal images. The near infrared photos don't have any information about temperature but are useful for studying plants because of the unique way chlorophyll reflects near infrared light. Also, the infrared map you link to at mapknitter.org has spam in the description field, which sort of detracts from the message. Hi Chris, Thanks for the note! Good point -- I did not link to a thermal image there, nor use one for the lead image. I will sort through MapKnitter to find the correct images! It's not just these particular photos, the Public Lab infrared cameras do not record thermal information. They are all near infrared cameras intended for vegetation analysis and don't tell us anything about temperature. Given the extreme cost of thermal imaging systems I don't know that anyone in PL has flown a FLIR on kite or balloon (or at least I can't find it in a search) though I think I ran across a article on someone using a thermal fishing BOB in that area (which is standard photographic imaging of a temperature indication device). I would be interested in seeing a thermal map of that area. I think you could gain insights on thermal or other pollution in NIR imagery by noting plant and algae status. Ecta64, that's a good point. Liz confirmed that they never used thermal imaging system on the Gowanus, so it must have been a miscommunication about the type of IR imaging conducted. I'll edit and update immediately. Chris, thank you so much for catching this mistake! true - images of melting ice was used by community members as "thermal clues" when searching for unknown/undocumented inflows into the canal.